Elite - Reclamation is the third book in our ongoing review of the Elite: Dangerous novels. 10% of the proceeds of this book are being donated to the Ashford Dyslexia Centre. Elite - Reclamation is quite different to the previous stories, it feels much more of a slow burn - a political thriller set in space. It's a story of powerful families, of highly evolved technology and life beyond death. It's also a story of betrayal, murder, intrigue, cruelty, greed, back-stabbing and politics. Thankfully though there is also a healthy dose of combat, adventure and a grand vista of space. It's a complex story that is told by a talented author, one who must be a fan of the Elite universe. The tone of the book is spot-on, it lives and breathes Elite and yet is strong enough to stand up on the story alone. The author manages to paint everyone in realistic shades of grey too, there are no good or bad guys, just everyone with their own agenda. It's incredibly rich and immersive however this does of course mean its not the easiest of books to read and at times the pace does suffer. Having said that it is a worthwhile trade-off because the story is just stunning. I love the fact that all three books I've read so far are all very different and yet each is clearly Elite. 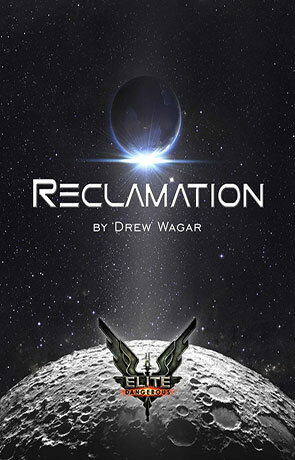 Reclamation is the thriller of the series, and an accomplished one at that. It's perfect for any Elite fan or indeed any fan of science fiction thrillers. Written on 17th November 2014 by Ant.